Often times, this is easier said than done. 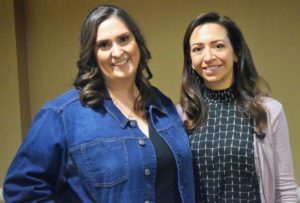 During December’s Professional Women’s Alliance luncheon, Catherine Alonzo, CEO of Javelina, spoke about the importance of setting goals, how fear can get in the way of completing them and how taking a little risk can lead to big results. Highlighting the power of belief, Alonzo stated that the lack of belief has a huge impact on whether a person accomplishes a goal. Alonzo further addressed why people lack belief in their goals, and how it can hinder their growth. Alonzo acknowledged that for everyone, fear is driven by something deeply emotional. She explained, that when an individual can turn that fear into faith, they will often realize that the fear was never rational. Recalling a time when she took a leap of faith to be honest with a friend and was surprised to receive a positive response, Alonzo explained that many times people build a false scenario in their head and that is when fear enters the equation. Instead, Alonzo suggested that people should turn their fear into faith. She explained that taking little risks still get results. “If you take little risk upon little risk, you can do anything you put your mind to and will find unlimited results,” said Alonzo. When setting goals, Alonzo shared that it’s better to keep an open mind to avoided being thrown off track by unexpected events.